This weekend was gray, gloomy and verging on cold, but that didn’t dampen the crowd at the National Apple Harvest Festival just outside of Arendstville PA. Hooded sweatshirts, with the hoods pulled up, were the clothing item of the day, and likely more than a few people wished they'd had gloves. After two days of warm, fall weather a 20 degree temperature change made the day feel more like November than early October. Apple Harvest is my favorite festival, and much of that has to do with the fairground. 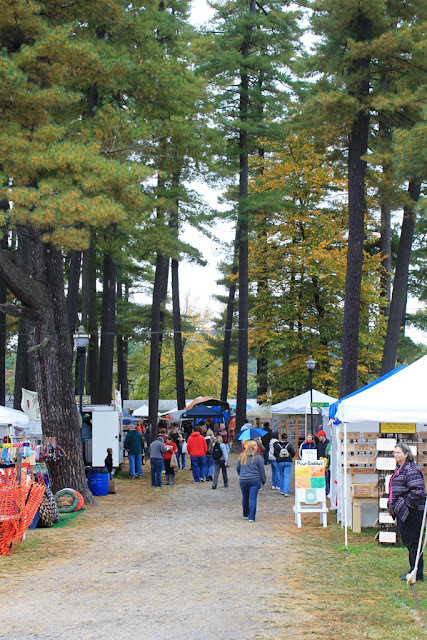 Nothing about the grounds is modern, and festival-goers walk around the pines to visit the vendors and food stands, which are abundant. You can watch cider and apple butter being made the old-fashioned way, with steam engines ranging in size from this little one to those the size of locomotives. If there’s anything made with apples that isn’t sold here, I don’t know what it would be. Apple sausage, apple butter, apple sauce, apple jelly, apple pancakes are just a few. You name it. If apples are in it, someone’s probably selling it at the festival. Held the first two weekends of October, the festival has been in existence most of my life, though it hasn’t been the National Apple Harvest Festival all that time. Adams County PA, where the festival is held, has long been known for its apple orchards, and it was a few of those growers who got together and started the festival about 50 years ago. The festival has grown so much since the early days that now more than 300 vendors take part, and the shuttle bus system that brings people up the narrow mountain road to the fairgrounds is the best organized I’ve ever seen. I like to go early on Sunday mornings, as I think that’s when the festival is less crowded. People come from all over the mid-Atlantic states to visit. This year I got a few Christmas gifts at the craft vendors and ate some really good festival food, which in my mind always tastes better for being cooked outside under the pine trees anyway. The difficult part is deciding what I'm going to buy because I wouldn't even have room just to sample it all. Oh that's a shame that you had a bit of lousy weather, Yea, it did feel like November today with the cloudy skies adding more chill to it. Cathy: Snow is getting close. They've had it on the mountains in the Adirondacks. In Alaska that kind of snow would be called termination dust. I don't think we have a name for it down here. it's just "snow on the mountain tops"
Scott: Apple funnel cakes? Oh, yeah! I avoided those this time around, but, boy, they sure were tempting.